Following my posts on formula milk, my officemates and I started talking about how effective milk companies' marketing efforts are in influencing consumers' buying choices. 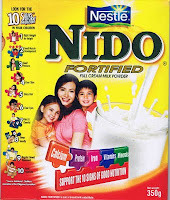 We remembered how the commercial for Nido was emphasizing how it had less sugar than other milks. My officemate then whipped out his own Nido powdered milk (which he used in his oatmeal). I was really appalled when I read the label! Now, Nido has another endorser - Dyan Castillejo whose "tagline" is "It pays to check the label". So let us examine the label of Nido. Read the ingredients list -- do you see sugar? So where did Suzy Entrata's 70g of sugar go? Now I undestand why it is only Nestle which has a "boycott Nestle" group especially targetting that company. Honestly, when I see "recombined whole milk", I wouldn't think that sugar was part of it. But even if Suzy's commercial already blatantly states that Nido has sugar, this ingredient is still not listed in the label! So, it will never pay to check the label as long as manufacturers are not transparent or honest enough to actually list each ingredient of the products they are selling. Oh yuck! Is that ever scary!! Hm. Are my comments not coming through? I left one earlier but it's not here. I'll try again. This is scary stuff. I'm glad you are pointing it out to everyone. Nestle is pretty evil but I think each country has its own labelling laws too. Buyer beware! I have given you an award because you have One Lovely Blog! Please come on over and pick it up and read what I had to say about you. Can't BFAD and other government agencies do something about this "false advertising" schemes of formula milk manufacturers? hi yan! it's a matter of policing and reporting. if no one reports, then nothing to act on. 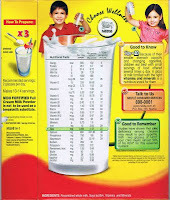 plus need documented reports pa.
what is the best milk for toddlers?